Dress: Free People (on sale!). Coat: BB Dakota (also love this one). Boots: Vintage Chanel (I added the silk laces). Sunglasses: Free People. Necklace: Pamela Love. Bag: Loeffler Randall (sold out, love this color for spring). Nails: Essie Marshmallow. Lip: Smashbox Be Legendary Long Wear Lip Lacquer in Coral. I woke up like this. Seriously, I feel like I woke up one morning looking and feeling full-on pregnant. With my now six month very-much-there bump, I’ve been reaching for maxi dresses on days when it’s warm enough to wear them. 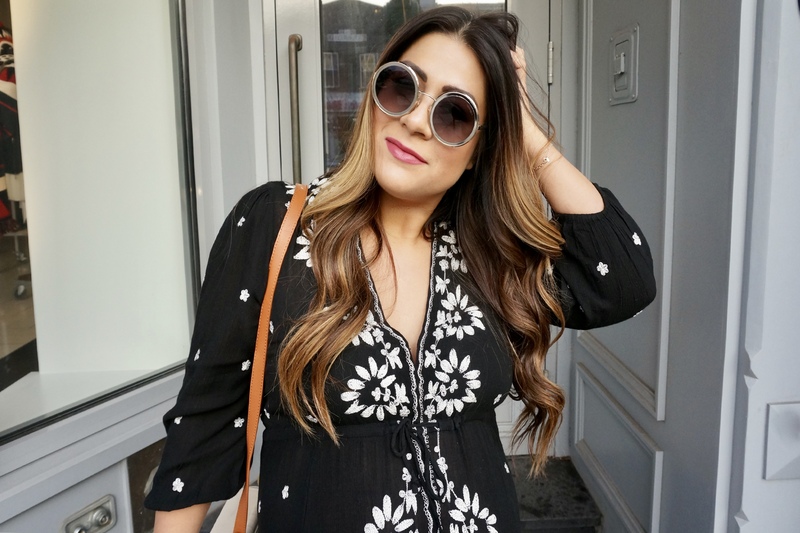 I am really looking forward to spring weather to allow me to wear more maxi’s, as well as forging full speed ahead on completing the cub’s nursery after this holiday weekend! What are you reaching for on nearly spring days?